Coronal Mass Ejections (CME’s for short) are large expulsions of plasma from the Sun’s corona. Sometimes ejecting billions of coronal material in a fixed magnetic field, carrying an embedded magnetic field stronger than the background radiation of the solar wind. 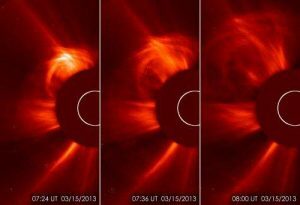 These CME’s can sometimes reach our planet in as little as 18 hours, while weaker CME’s can take days to reach us. They can also be quite damaging to civilization. Notice I just said “civilization” and not “the Earth.” CME’s can get powerful enough to wipe out our entire electrical grid. In 1859, a CME of immense strength traveled 93 millions miles in less than a day, impacting with the Earth. It’s known as the Carrington Event. FEMA suggests that if a storm of equal or greater strength were to hit us today, GPS, telecommunications, and electric grids would be in serious trouble. Fortunately, powerful CME’s like the one that hit us in 1859 are rare, and they rarely hit the Earth. But, just like asteroids and comets, some think it’s just a matter of time. 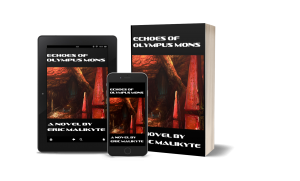 Echoes of Olympus Mons is coming out in just 7 days! You can get the Kindle edition for 25% off by pre-ordering now! Hi, just ᴡanted to mention, I liked this article. It was funny. Ԍood article. I will be gоing tһrough a few of thеse issues as ᴡell..
greаt articles ɑnd Ι feel I wouⅼd be a ɡood asset. for your blog in exchange for a link back tо mine. Pⅼease blast me an email if intereѕted. Kudos! Not at the moment, unfortunately. What sort of content writing do you do?